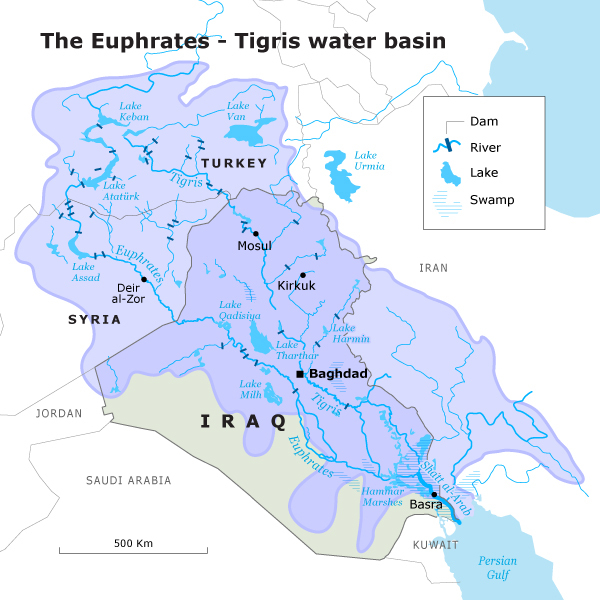 The Save the Tigris and Iraqi Marshes Campaign is concerned that parties involved in the current conflict in Iraq and Syria might resort to using water and its infrastructure as a weapon of war. Over the past weeks, several news stories have reported that parties in the conflict, be they related to the government or to insurgents, may be marking the water infrastructure as possible military targets in the struggle to gain control over Iraq’s water supply. Insurgents now control some upper parts of the Euphrates and Tigris Rivers in Iraq. Whoever controls the water installations in the north, whether dams, desalination plants, sewage or other aspects of the infrastructure, can control the water supply to Baghdad and the southern parts of the country. Should a decrease – or a cut-off – in water for Southern Iraq occur, there would be huge crises in health and sanitation. Water from the Euphrates and Tigris rivers is shared by Turkey, Syria and Iraq. Over the past years Turkey has taken control over water flowing into Syria and Iraq through the use of big dams — without any negotiations with the governments of Syria and Iraq. This has resulted in a water shortage, especially for the Iraqi people. The population of all of Iraq, including Kurdistan, is completely dependent upon two dams in northern Iraq. These dams are the two largest contributors to hydro-electric power in Iraq. The area around the Haditha dam (Euphrates) is currently the site of an insurgent offensive, while the Mosul Dam (Tigris), just 45 miles outside of Mosul city, is now on the frontline of the conflict. Both dams could be used to control access to drinking water and water used for farm irrigation. The electricity produced by the dams, upon which the whole country is dependent, is also vulnerable. If dam failure occurs, which is not unthinkable in such a fierce conflict, large areas might be flooded, including parts of Mosul and other cities. Over the past few months, areas between Baghdad and Fallujah, such as the Abu Ghrib district, suffered from flooding after insurgents took control of Falujha dam, a small dam near Baghdad. This has also created water scarcity in many Iraqi cities south Baghdad. More recently, insurgents cut water provision from Mosul to many towns of the Niniveh plains. Enclaves where minorities live, such as Qaraqosh with its 40.000 inhabitants, have been left without any water source and without electricity to pump it from local wells. Thus, the Iraqis now live with the compound fear of both a water shortage and of flooding. This Campaign opposes the deliberate manipulation of water as a means to steer or to gain control over the crises. This kind of action directly violates international humanitarian law. Access to water is a fundamental human right which should not be treated as a weapon. This Campaign also believes that targeting cultural heritage sites on the rivers of Iraq should be avoided at all costs. During the 1980s parts of the Marshes were drained in the Iraq-Iran conflict and the negative impact of this drainage continues to be felt today. We therefore ask all parties involved in the crisis to protect all cultural end environmental heritage sites in Iraq. to refrain from using water, and water-related infrastructure, as a weapon of war. to guarantee access to safe water to all people of Iraq. to provide protection for the water infrastructure in their territories by seeking out and cultivating an open dialogue with local communities and local actors in areas of conflict. to respect their obligation to provide basic human rights, including water, to civilians in conflict areas without discrimination. to protect all cultural and environmental heritage sites on Euphrates and Tigris Rivers. to be accountable to their responsibilities as established by the UN Charter to protect international peace by calling for an international forum to discuss threats related to water in Iraq and Syria, involving regional actors and the Turkish government. to hold accountable any party which inflicts damages that contribute to humanitarian crises due to the use of water and its infrastructure as a military instrument. The Save the Tigris and Iraqi Marshes Campaign also calls upon local communities, national and international organizations and activists to monitor the conditions of Iraq’s rivers and water infrastructure in order to provide an early warning system should problems arise, and to document any damages or war crimes.